Recently, I’ve been curious about the historic place of “preaching stations” and their relevance for modern missions. It could just be me, but there seems to be little discussion or usage of the construct in “church planting” efforts. Not sure of the reason for this. Maybe it’s because of the subdued place of preaching as the prime vehicle for conversion – at least within broader evangelicalism. I fear that within Reformed circles, it may reflect church planting that engages more in picking up Calvinist proselytes (at best) or bald sheep-stealing (at worst). That is, church growth that aims not so much at the lost community as an ever-recycling Christian one. Within my own more conservative orbit, I think it’s employed as a downgrade for a weakening or dying congregation. First, preaching stations are forward-moving Gospel efforts, in the direction of full-fledged congregations. They are missionary endeavors. Second, they operate in the right order with respect to sacraments. Word first; then assuming reception, baptism and the Lord’s Supper. Throw the Gospel net far and wide, but keep the sacraments out of the equation until there are “fruits worthy of repentance.” Third, aggressive, territorial household visitation as an indispensable adjunct to the preaching station. 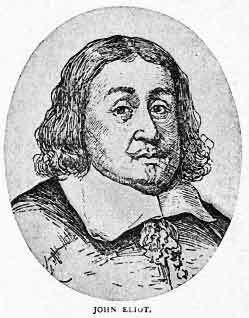 The following are anecdotes from the labors of Puritan missionary John Eliot (1604-1690) among the Native Americans of early Massachusetts. The extract is drawn from The Life of John Eliot by Nehemiah Adams (1847). Specifically, we witness Eliot and company catechizing the heathen, ushering them into the holy knowledge of the faith and so into the bosom of the Church. Obviously, our Puritan forbears entertained a broad view of this discipline. It was not simply for those in the Church seeking to deepen their understanding of but also for those laying hold of the skirt of a Jew and begging for guidance to Zion’s God. After one or two more posts, I’ll conclude with some reflections on Eliot’s evangelistic catechesis. An hour and a quarter was occupied in the discourse. 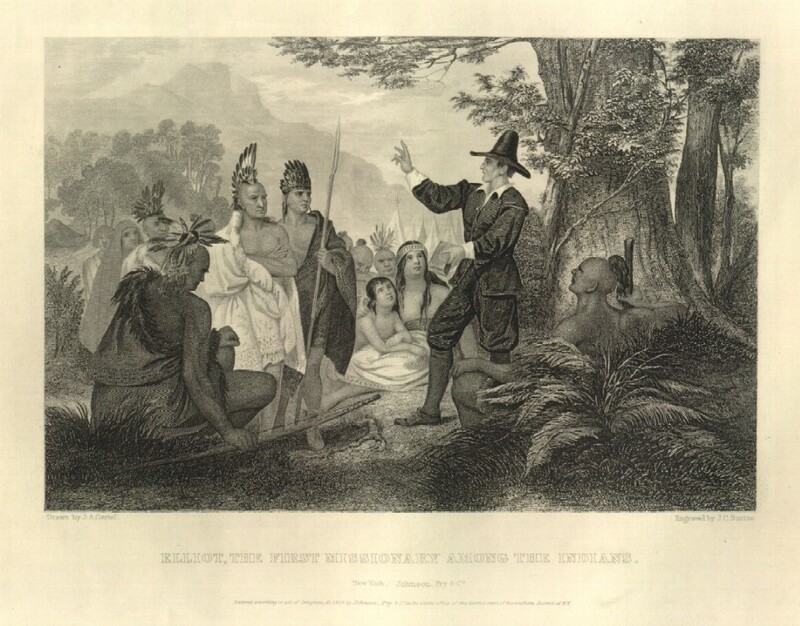 Mr. Eliot gave the Indians first a brief exposition of the ten commandments, showing the wrath and curse of God against those who break the least one of them. The subject was then applied, and the law having been brought to do its work in their hearts, and their sins being pointed out to them, as Mr. Eliot says, with much sweet affection, Jesus Christ was preached to them as the only Saviour. He told them who Christ was, and what he did, and whither he had gone, and how he will come again to judge the wicked and burn the world. The creation and fall of man, the greatness of God, heaven and hell, the pleasures of religion and the miseries of sin were then explained in language and with illustrations suited to their capacity. But there were some questions proposed by them which Mr. Eliot says some special wisdom of God directed them to ask, as, for example, How may we come to know Jesus Christ? Mr. Eliot told them that if they could read the Bible they would see clearly who Jesus Christ is, but inasmuch as they could not then read, he desired them to remember what he had told them out of the Bible, and to think much and often upon it, when they lay down on their mats in their wigwams and when they rose up, and to go alone in the fields, and woods, and muse on it, and so God would teach them. He told them that if they would have help from God in this thing, they must begin to pray, and though they could not make long prayers as the English did, yet if they did but sigh and groan, saying, “Lord, make me to know Jesus Christ for I know him not,” and if with all their hearts they persisted in such prayers, they might hope that God would help them. But they were especially to remember that they must confess their sins and ignorance to God and mourn over them and acknowledge how just it would be in God to withhold from them any knowledge of Christ, on account of their sins. 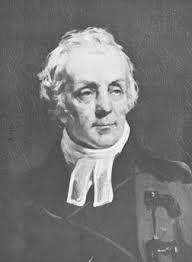 This instruction was communicated to them by Mr. Eliot through the Indian interpreter whom he had brought with him, but he says he was struck with the fact that a few words from the Preacher had much greater effect than many from the interpreter. One of them asked, whether Englishmen were ever at any time so ignorant of God and Jesus Christ as they themselves? Another put this question: Whether if the father be naughty and the child good, will God be offended with that child ? because in the second commandment it is said that he visits the sins of the fathers upon the children. They were told in reply to this that every child who is good will not be punished for the sins of his father, but if the child be bad, God would then visit his father’s sins upon him, and they were bid to notice that part of the second commandment which contains a promise to the thousands of them that love God and keep his commandments. One of them asked, How is all the world now become so full of people, if they were all once drowned in the flood? This led to the story of the ark and the preservation of Noah. Mr. Eliot then proposed some questions to them, for example, Whether they did not desire to see God, and were not tempted to think there is no God because they could not see him? Some of them answered, They did desire to see Him if it could be, but they had heard from Mr. Eliot that he could not be seen, and they did believe that though their eyes could not see him, he was to be seen with their soul within. Mr. Eliot endeavored to confirm them in this impression, and asked them if they saw a great wigwam or a great house, would they think that raccoons or foxes built it? or would they think that it made itself? or that no wise builder made it, because they could not see him who made it? Knowing that the doctrine of one God was a great stumbling block to them, Mr. Eliot asked them if they did not think it strange that there should be but one God, and yet this God be in Massachusetts, and in Connecticut, in Old England, in this wigwam, and the next, and every where at the same time? One of the most sober of them replied that it was indeed strange, as every thing else they had heard preached was strange, and they were wonderful things which they never heard of before, but yet they thought “It might be true, and that God was so big every where.” Mr. Eliot illustrated the truth by the light of the sun, which, though it was but a creature of God, shed its light into that wigwam, and the next, in Massachusetts and Old England, at once. He inquired of them if they did not find something troubling them within after the commission of murder, theft, adultery, lying; and what would comfort them, and remove that trouble of conscience when they should die and appear before God? They replied that they were thus troubled, but they could not tell what they should say about it, or what would remove this trouble of mind, whereupon Mr. Eliot enlarged upon the evil of sin and the condition of the soul which is cast out of the favor of God. Having spent three hours in this interview, Mr. Eliot asked them if they were not weary, and they said, no. But thinking it best to leave them with an appetite, Mr. Eliot concluded the meeting with prayer.